Acorns, one of the distinctive features of oaks, form the female portions of the trees’ reproductive system and provide a means by which the genus is classified into species. Trees in theLeucobalanus group, which includes White oaks, have sweet acorns whose scales are arranged in a spiral pattern that mature in one season. Oaks classified as Erythrobalanus, such as Red and Black oaks, have spiral patterned acorns that are hairy, bitter, and become mature after two years. In a third group, Cyclobalanus, the scales of the trees’ acorns form concentric rings. Oaks in theLeucobalanus and Erythrobalanus classification are also differentiated by leaf structure, as the former group has smooth leaves while the latter’s edges are more pointed. The City of New York acquired the land that is now Tall Oak Playground through condemnation on March 2, 1949. Parks and the Board of Education have jointly operated the park since October 6, 1951. The playground opened on October 6, 1951 as P.S. 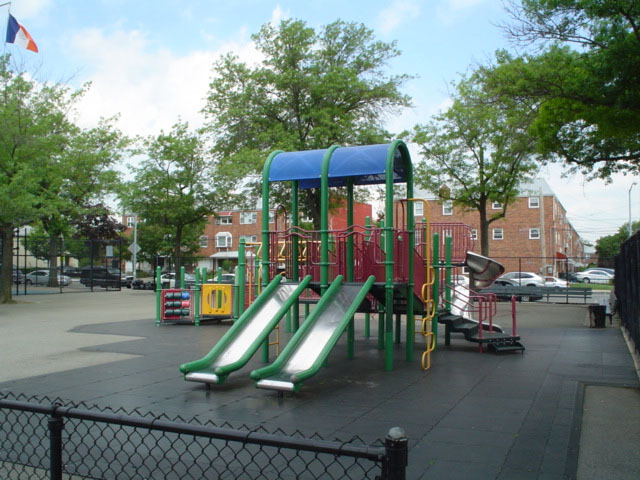 46 Playground and was given its current name by Commissioner Stern on January 19, 2000. Located adjacent to P.S. 46, this playground contains basketball and handball courts, play equipment with safety surfacing, a baseball diamond, comfort station, swings, benches, and a spray shower. The playground section of the park was renovated in 1998 through $179,000 allocated by Mayor Giuliani. In 2000, Council Member Sheldon S. Leffler funded a $450,000 renovation of the playground, adding a multi-purpose play area, as well as new basketball and handball courts.